Lancaster University, Lancaster UK, broadcast on BBC Radio 3, February 23, 1969. And here's something for fans of British jazz... Michael Gibbs is not a familiar name among casual jazz listeners but for serious fans, the Rhodesia-born (now Zimbabwe) composer, conductor, arranger and producer as well as a trombonist and keyboardist is known for his collaborations with Gary Burton, his student, and for his ability to utilize rock elements in orchestral jazz. As the wikipedia notes, Gibbs also taught at Berklee for much of the 1970s. First of all, a word of thanks to 6135terry for sharing the Michael Gibbs tracks on the internet. But there is some uncertainty about the date of this concert. 6135terry gave the broadcast date as February 23, 1969. Another fan, notreally, cited the performance date as April 11, 1969 and the broadcast date as April 30, 1969 (BBC Radio 3). 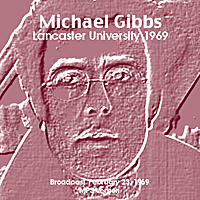 6135terry commented: "This is very likely the earliest Mike Gibbs broadcast, predating by many months his first recordings under his own name. The band is much smaller and the performances more intimate than on that first album, Michael Gibbs, and the prominence of the late Mike Osborne is a nice surprise. "The sound has occasional distortion and a little static and varies between almost an A- and almost B+. The music more than compensates for those flaws, however, and for fans of Gibbs, British jazz of that era (and Jack Bruce completists) it's another must-have." Steve Voce [a high profile jazz journalist and former broadcaster in the UK], in Jazz Journal 22/5 (May 1969) wrote: "Gibbs band was obviously going to be a good one, as a glance at the line-up indicated. But we had already been fired by some telephone conversations we had had with Mike during the previous couple of weeks. He is quite single-minded in his intensity over music, and such enthusiasm as he showed is inevitably both infectious and awe-inspiring. Appropriately the evening began with Sweet Rain, featuring John Surman in a muscular and yet delicate reading of this lovely ballad. Surmans command of the soprano is as complete as his mastery of the baritone, and his pithy opening statement was backed by Phillip Lees delicately-chorded guitar and John Marshalls drums. As Surman reached the end of his solo the orchestra came in and right away set the tone of the evening in a beautifully-orchestrated passage. Mike Osborne, an altoist who improves with every hearing, came next, backed strongly by Jack Bruces bass-guitar. Bruce was most impressive throughout this concert, although there is something dogmatic about the electric bass which seems to impair its flexibility. His performance on the legitimate bass on the NJOs LP was, from my point of view, far more imposing. Alan Skidmore came next, with his tenor skirting confidently and economically in a solo which, like most of his work that evening, had the aura of early Coltrane, while somehow remaining independent of any substantial influence. The next piece, Family Joy, Oh Boy, was a simple theme which rocketed along with great drive, and provided a great leaping-pad for Bruces guitar. After the orchestra had stated the theme, it was repeated in fairly deadpan fashion by Frank Ricottis vibes and then given over to a torrential solo by Bruce, which would have been quite impossible on the orthodox bass. Fly Time Fly was written by Gibbs in 1961 while he was at Berklee with Gary Burton, and it had a melodic sweetness which much reflected Burtons thinking. Two other pieces written for Burton, Feeling And Things and June 15th 1967 also made their appearance, but the high spot of the concert were the two pieces which Gibbs tells me were inspired by the French composer Messiaen, Liturgy and And On The Third Day, the latter in particular a most substantial work. Mike was at great pains to emphasise that he in no way attempted to reflect the religious inspiration of Messiaen. It might not have been religious, but the performance of And On The Third Day was certainly inspired, and made one hope that Verve will now go chasing after the Gibbs orchestra to catalogue alongside the New Jazz Orchestra." As interneter bohr99 commented: "Certainly the best British reeds section ever put together..." And it is an entertaining and spirited performance all the same.